This book presents selected papers on various aspects of rubber engineering, technology, and exploitation. The contributions range from new methods of the modification of filler surface and crosslinks structure of rubber vulcanizates, through modern functional elastomer composites, to aspects of their thermal stability, flammability, and ozone degradation. Each chapter contains a brief introduction to a particular topic, a description of the experimental techniques, and a discussion on the results obtained, followed by conclusions. The book will help to broaden the knowledge of researchers in the field of rubber compounding, crosslinking, and behavior under various exploitation conditions. The research and development presented in this book has potential for industrial applications as well as for new materials and technologies. The book also details theoretical background to a number of experimental techniques, which should make it interesting to research students and professionals. Dariusz M. Bielinski, PhD, is a professor at the Institute of Polymer and Dye Technology at Lodz University of Technology, Poland, and is also affiliated with the Division of Elastomers and Rubber Technology at the Institute for Engineering of Polymer Materials and Dyes in Piastow, Poland. His research interests include material engineering, polymer chemistry and technology, polymer physics, surface engineering, and tribology. He has published many scientific papers, books, and patents, and he is an editorial board member of several professional journals and has worked on many technical program committees. 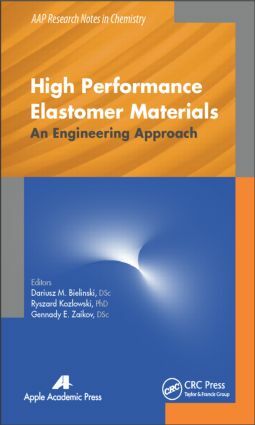 Ryszard Kozlowski,PhD, is the author and co-author of more than 250 original papers, 21 patents and know-how licenses, and 24 implemented technologies. He leads the activity of the Institute for Engineering of Polymer Materials and Dyes, Branch House for Elastomers and Rubber Processing, Piastow, Poland. He initiated and conducted interdisciplinary research on broadening raw material resources and utilization of natural fibers (flax, hemp, wool, and silk), retting, and extracting and processing of bast fibers, among other subjects. His special interest is in the flammability and toxicity of diversified fibers, polymers, fabrics, and products, including biocomposites, with a focus on the high practical aspect of this research. His specialty is flame retardancy of polymers and modern environmentally friendly composites, and he conducts applied science in the scope of natural polymeric materials.